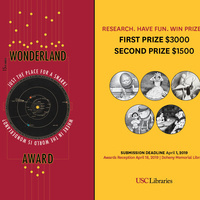 The 2019 Wonderland Awards are an annual multidisciplinary competition, open to students from all California universities, which encourages new scholarship and creative work related to Lewis Carroll (1832–1898). The inaugural awards were hosted in 2005 and there are now more than 400 student submissions in the Wonderland Awards Archive. The 2019 deadline to submit is April 1st!